If you ever want to start a heated discussion, just ask a Chilean and a Peruvian who created pisco. There is a strong possibility both sides will claim its conception. Pisco, distilled with grapes, is considered a brandy. Both countries take credit for its creation and each follows its own set of distinct rules for distilling this spirit. >> Only eight grape varieties can be used in the distillation process. >> Must age three months in stainless steel or glass. No wood aging is allowed. >> Aged a minimum of two months in glass or stainless steel. French or American oak barrel aging is allowed. 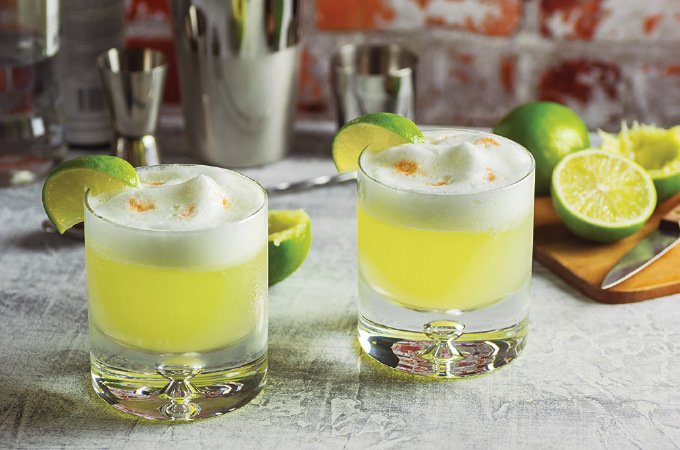 Fill cocktail shaker with ice, pisco, lime juice, simple syrup and egg white. Shake vigorously for 15 seconds and strain into cocktail glass. Garnish with bitters. Add all ingredients to highball glass. Fill with ice, stir and garnish with lime twist. Justin Wolf is sommelier at The Four Seasons Hotel – St. Louis.